The largest, most active neighborhood in the 32312 zip code is Killearn Lakes Plantation (KLP). Every year we see this popular destination rank among the top 3 places to live in Tallahassee. With several thousand existing homes and a small number now under construction, buyers are attracted to Killearn Lakes Plantation for its A-rated schools, walking and nature trails, a Tom Fazio golf course, and multiple styles of homes. The community of Killearn Lakes is divided into several smaller neighborhoods which includes Deerfield Plantation, Deerwood Plantation, Golden Eagle Plantation, Killearn Commons, Kinhega Landing, Kinhega Oaks, Pine Landing, Scotswood, Seven Oaks, and The Glen at Golden Eagle, and they are often among the highest demand communities in Tallahassee. To provide a clear picture for the trends occurring in KLP, our report includes graphs of home prices, home values, and home sizes, as well as current listings in the Tallahassee MLS and all closed home sales going back to 1991. It is important to note that the narrative contained below is for sales through December for all previous years, but through the beginning of October in 2015. The graphs and the closed sales table will be continuously updated into the future (meaning bookmark this page if you always want to know the current status of homes in Killearn Lakes Plantation). For all of the real estate graphs found in this report, you will find the number of closed home sales for each year (red columns, measured on the left vertical axis), and an important real estate statistic shown in blue (measured on the right vertical axis. It is important to note that sales are through December for all previous years, but through the first week of October in 2015. The average sales price for a home in Killearn Lakes Plantation continues to decline and remains at the lowest level recorded for more than 12 years. The average home price now is $237,850, representing a 19% decline from the high recorded in 2006. Home sales activity continues to be robust. 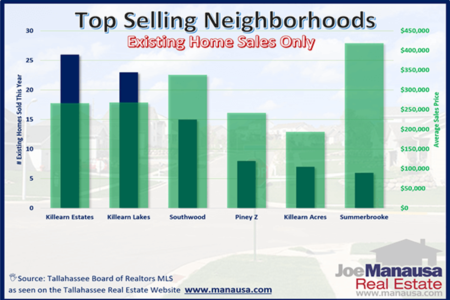 So far in 2015, there have been 226 closed home sales in Killearn Lakes Plantation and its included neighborhoods, a level higher than for all twelve months of each of the past 7 years. Average home values in Killearn Lakes have recovered nicely in 2015, up 5% over last year. With so many homeowners owing more on their homes than what could be gained in a sale, this growth in equity should help invigorate the market. Currently, home values are still 20% below the level recorded at the peak in 2006, so each percent of improvement frees up many more homeowners who will finally be able to sell their homes. Through early October, the average value of a home sold in Killearn Lakes Plantation has been $115 per square foot. The average home size sold in Killearn Lakes Plantation typically falls in a range of 1,800 to 2,100 square feet, and this year is not showing anything unusual. The 226 home sales thus far in 2015 have averaged 1,962 square feet. 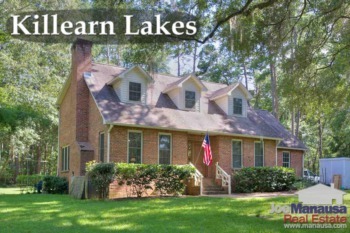 The following map and list of homes show the current listings in Killearn Lakes Plantation. The following list includes roughly 6,500 home sales in Killearn Lakes Plantation going back to 1991. You can change the sort order by clicking any one of the titles in the header. I hope you enjoyed our October 2015 update on home sales in Killearn Lakes Plantation, please feel free to drop me a note if you have questions not covered in this report.